You can imagine how excited we are that for the ninth time, and the sixth time in a row, KNOM is being recognized with the Gabriel Radio Station of the Year Award! It is the highest honor in broadcasting. We are humbled and joyful, and we share this incredible award with you. The awards ceremony is scheduled for Saturday, October 20th in San Antonio, Texas. We’d love to see you there. If you can join us, please immediately contact KNOM general manager Tom Busch for information. Thank you very, very much for your help this past month, both financial and prayerful. You are our strength, and we pray that God greatly blesses you. NEW FACES (left): We gained four new volunteers in mid-August. 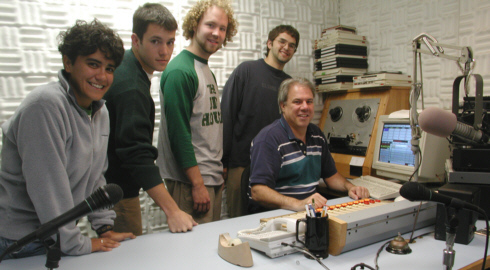 With KNOM program director Ric Schmidt, from left: Julia Arrotti, Ryan Conarro, John Hall and Tim Bodony. Together with 2000-2001 volunteer Andrew McDonnell, they promise to be a great crew, and you’ll learn more about them in this issue and in the months to come. “THE LORD BE WITH YOU.” It’s a popular KNOM program originated by Fr. Chuck Peterson, SJ many years ago. It instructs Eskimo deacons on the upcoming Sunday’s gospel reading. While fascinating and entertaining, it is time consuming to write and produce, and has been off the air for about a year, awaiting a willing host. Thanks to Fr. Paul Cochran, SJ in the village of St. Marys for taking on this program in August. It’s great to have it back! INSPIRATIONAL SPOT: Dear God, I do not know where you are leading me. I do not even know what my next day, my next week or my next year will look like. As I try to keep my hands open, I trust that You will put Your Hand in mind and bring me home. top WE’RE OFF THE AIR!!! 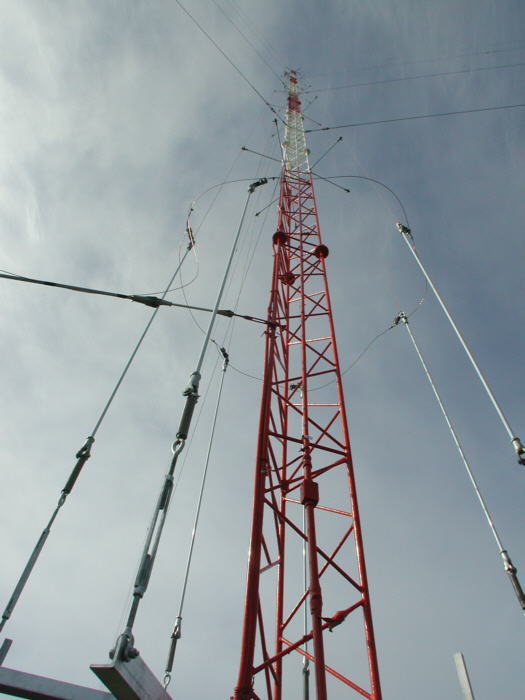 In mid-August, a tower crew suddenly became available, and completely rebuilt our antenna over the course of a day. It took a few hours for Tom Busch and Les Brown to retune the tower and get us back on the air, stronger and more reliable than ever. 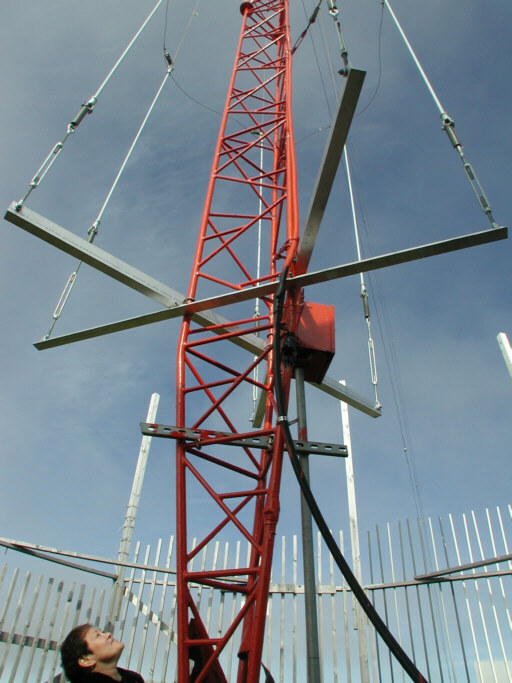 KNOM’s antenna is a folded unipole, which involves wires hanging alongside the tower. 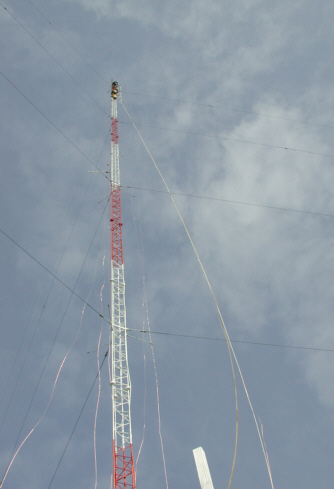 This tower work increased the number of wires from three to six, and improved the “match” between the transmitter and tower. (Left) Six new unipole wires dangle from the tower, waiting for brackets, while two tower climbers work near the top of the tower. (Left) The base of the tower, with the "hold-down" insulators attached but the wires not connected. (Left) The completed folded unipole as seen from the tower base. It is fed by the wire at the left. 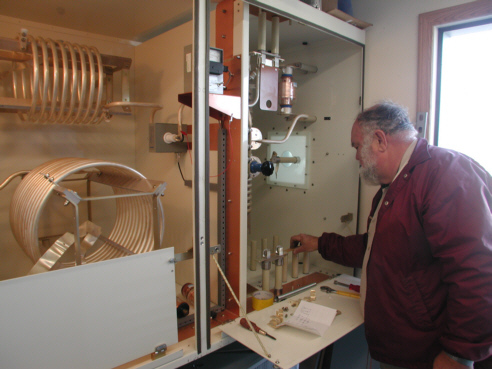 (Left) Les Brown installs three capacitors to our antenna tuning unit, at the suggestion of consulting engineer Alan Gearing. When KNOM is on the air, the point which Les touches holds 5,000 Volts. We have elaborate procedures to ensure that power is always off while we’re working. Normally, these circuits are shielded by secure steel covers. Thank you to everyone who contributed toward this important technical project! There wasn't room to mention it in the paper "Static," but Les Brown and Tom Busch took the station off the air a week earlier, opened every panel of the transmitter and inspected, tightened and cleaned everything as part of regularly scheduled annual maintenance. The Nautel ND-25 transmitter, which began its fourth year on the air on August 16th, has not had a single component fail. MAKING WAVES: For several days, Nome was swarming with visitors who came in by sea, first the Coast Guard cutter Storis, followed by the icebreaker Polar Sea, filled with scientists studying the Alaskan and Russian coasts. On August 19th, Nome was visited by the 340-foot clipper Odyssey, which was retracing the route taken by the 1899 expedition by railroad tycoon Edward Harriman. In a less ordinary visit, Norwegian adventurer Roy Karlsen pulled into the harbor in an 18-foot boat that he’d sailed from Sweden across the Atlantic, through the Panama Canal, and up to Nome. Karlsen had planned to continue back to Sweden across the northern coast of Russia, purchasing fuel from Russian ships. At Nome, however, Karlsen learned that there are no ships along Russia’s northern coast this year, and he suspended the effort until 2002. To face the ever changing tide, darkest night or dreary day, knowing that You’re guiding me, always near me, lest I stray. INSPIRATIONAL SPOT: God formed us. Sin deforms us. Christ transforms us. top Meet KNOM volunteer Julia Arrotti (left), by the Bering Sea on a blustery August day. write creative nonfiction. Welcome, Julia! SEVENTY YEARS AGO: Aviator Charles Lindberg and his wife Anne visited Nome in late summer 1931. GOODBYE: It’s sad parting with Victoria P, who has given our mission two absolutely outstanding years of volunteer service in news reporting and interviewing. We and our listeners will greatly miss her as she moves along. Please join us in prayer for her continued happiness and success as she returns to the Lower 48. Farewell, Victoria. Thank you. 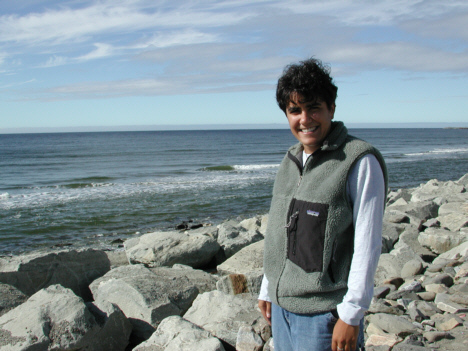 100,000 square miles of arctic Alaska, thanks to you. INSPIRATIONAL SPOT: Loving God, Creator of all, bless our children with Your Love and Goodness. Help us to encourage them each day to do their best. Strengthen them in times of difficulty. Make them mindful of the needs of others, caring for elders. May our children always follow You. top HIGH WIRE: (left) KNOM business manager Florence Busch checks out the newly rebuilt KNOM antenna, with six “folded unipole” wires. The long vertical rods you see are insulators which hold the wires in place. KNOM engineer Les Brown was prepared for a tower crew, but wasn’t expecting them until next year. We had less than one day’s notice. Material had not arrived in time for a scheduled job on the North Slope, and the crew of four zipped into Nome. In one day, they plumbed the tower (and our studio tower, too), checked guy wire tensions, replaced all light bulbs, removed the old unipole brackets and wires, moved a National Weather Service antenna that was in the way, and installed the new unipole brackets and wires. One KNOM’er remarked that it was like watching a time-lapse movie! 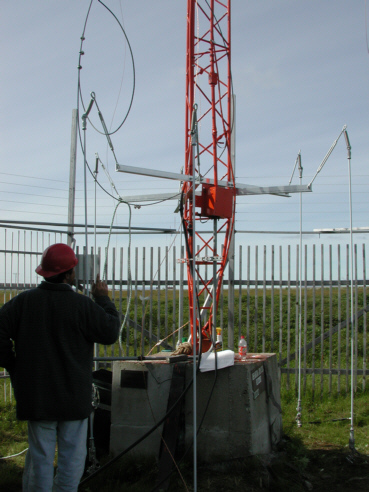 Again, we sincerely thank our many contributors who together paid for this needed rebuild of KNOM’s 31-year-old antenna. FOOD FOR THOUGHT: Many friends have written to express horror at Nome’s high food prices, which we reported to you in June. As you know, all fresh or frozen food must be shipped in by air. Some canned goods arrive by summer oceangoing barges. In mid-August, the University of Alaska released what Nomeites already knew, that prices held steady this summer, at 197.6% those in Portland, Oregon. We cannot thank you enough for your kindness, your prayers and your financial help. Among our many awards, the best are the loyalty of our audience, and your faithful support. Without you, we could accomplish nothing, but with your assistance, this mission will remain strong long into the future as we spread God’s Love, and combat alcoholism and drug abuse, suicides, domestic violence and the many other health and social problems suffered by thousands of village families throughout 100,000 square miles.